I have long loved eating greens, but aside from my one make-ahead green smoothie recipe, have been hesitant to drink them! When I saw that Jaclyn Downs was offering a juicing workshop about a mile from my house, I signed up immediately. Jaclyn Downs has extensive education in the field of diet and nutrition, is a wellness coach, and teaches seminars that educate and inspire people as to how they can make gradual, lifelong changes in order to reach immediate and future health goals. I actually did not go into the workshop expecting to purchase a juicer, but I have heard more and more about the benefits of juicing recently and have a number of friends who swear by it. I saw this as a learning experience and a way for me to pass along helpful information to those who may be intrigued by the concept. During the seminar, Jaclyn offered the basics for those new to juicing, which she shares below. Better yet, she juiced and provided lots of samples. It became readily apparent that there are endless combinations, some that I found quite delicious, others that I found less palatable. For instance, a little pineapple went a long way in providing sweetness and great taste to a juicer-full of broccoli and celery. Lemons, though a super healthy item to juice, were a bit too sour for me when juiced with kale alone. Beets, beet greens, and red pepper tasted just like cold, cooked beets, while a mix of cucumber, carrot, and celery was light and refreshing. It became apparent that experimenting with a variety of produce is the key, and that everyone had his or her own favorite combinations. As with food in general, preferences are a very individual thing. In the meantime, I welcome Jaclyn to The Fountain Avenue Kitchen and encourage anyone with questions to comment below or contact Jaclyn directly. Her email is linked at the bottom of this post. So, without further adieu, here is Jaclyn…. Sometimes, when I hear someone talking about entrusting their health and/or weight loss goals into a magic pill, powder or potion, I want to hug them… after emphatically shaking those silly thoughts right out of their brains. It’s rare, if even possible, that something formulated and processed in a lab can be the key to health, much less weight loss. Those creations are complex, involving machines, solvents, chemicals and thermometers. There is a much more simple way to drastically boost the level of health within all systems of the body. Juicing! Juicing helps to enable our cells, organs, and glands to function efficiently, which creates a clear-cut path to our health goals, whatever they may be – losing weight, having more energy, sleeping better, and eliminating digestive complaints or the myriad of other common complaints that slow us down and make us feel crummy. If your health goal is to lose weight, juicing is a great way to get the body on track to lose weight and keep it off. I tell my clients that we don’t get healthy by losing weight, we lose weight by getting healthy. Juicing puts you on the fast-track to health! I have found that many people are just as interested in juicing as they are intimidated by it. There are so many questions – Which juicer is right for my home? Are there any vegetables I shouldn’t juice? How often should I juice? How long can I store juice, if I can even store it? There are certain things to consider if you are are new to juicing, which I address in my Juicing and Smoothie Workshop. Below are a few key points. Start slowly – Begin with vegetables and fruit that you know you like the taste of. Ease into it – Use foods that are friendly with your stomach. If your stomach makes its presence known shortly after juicing, you might want to use less of the potential offending food, or eliminate it for a while and revisit it again some time later. Use as much pesticide-free produce as you can. Pesticides are known neuroendocrine disruptors (they wreak havoc on brain cells and hormones). Each year the Environmental Working Group provides a list of the most and least contaminated produce. I base much of my grocery shopping on this list. Drink your juice as soon as possible. Many of the nutrients and live enzymes that make the juice so beneficial are delicate. Drinking your juice right away ensures maximum potency, although can be saved for later if stored properly. 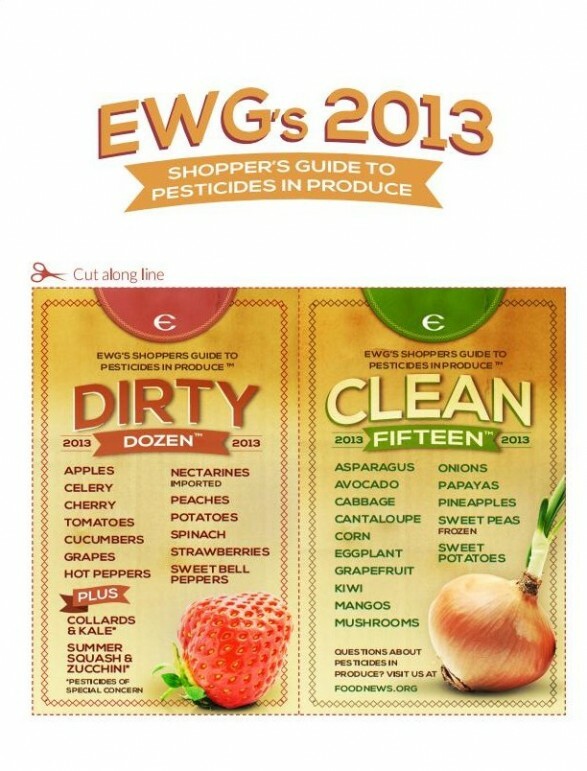 Here is a link to a printable version of the Dirty Dozen/Clean Fifteen 2013 list from the Environmental Working Group. Centrifugal juicers are faster and less expensive than masticating juicers, however, they do not juice as efficiently, especially when it comes to leafy greens. Because they have a fast motor that can create heat from the friction, the juice can lose some of its nutritional value and begin to oxidize sooner than juice that was extracted with a masticating juicer. Masticating juicers pulverize food. They spin at a much slower RPM, which makes the juicing process much slower, but preserves the nutrients and introduces less oxygen into the juice. Masticating juicers also juice more efficiently so that less veggies, in most instances, create more juice. Masticating juicers squeeze the foods you place into them, and some, like the Omega that I have, can also grind meat, coffee, and spices, as well as make baby food, nut butters and pasta. Too much fruit – Yes, juicing fruit is delicious, but juicing too many fruits or root veggies can create a sugar overload and an unhealthy insulin response. Making the same juice all the time – People are creatures of habit. This is not good when it comes to consuming the same foods all the time. Not only are you making the nutritional scale imbalanced, you are putting your body at risk for developing food sensitivities. Change up your juicing ingredients to ensure a wide variety of nutrients for optimum health. 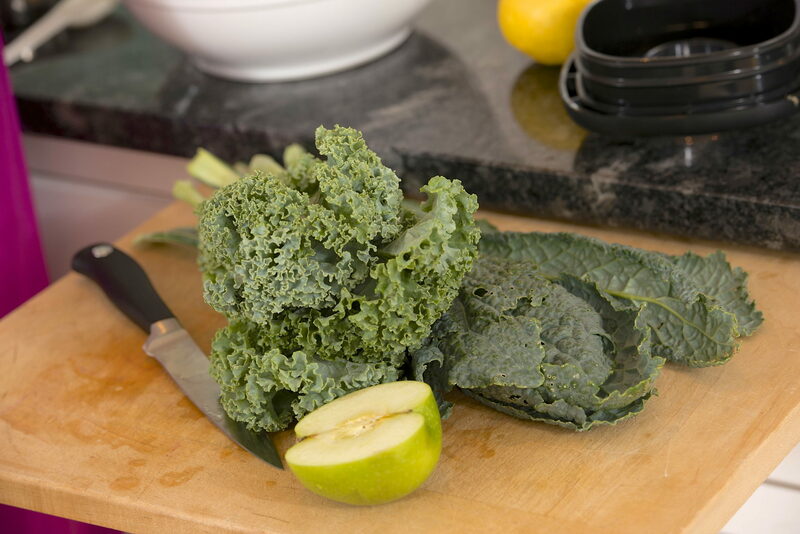 Not allowing for optimal nutritional effects – Juicing is most beneficial on an empty stomach. Don’t drink juice with a meal, and wait at least 15 minutes after juicing to eat. If you have any questions or concerns about juicing, please feel free to contact me through my website, www.GetBalancedWellness.com or via email, JaclynDowns@GetBalancedWellness.com. Also, I’ll happily come to your home or business to present my Juicing and Smoothie Workshop–for those living in the South Central Pennsylvania area–and show you how delicious juicing can be – even green juices! This is Ann again. Jaclyn is a source for Omega Juicers and has kindly offered to help anyone interested navigate through the process of which juicer to buy and how to get started. Additionally, if you decide to purchase a juicer and mention this blog post when you contact Jaclyn, she has offered to give you a “Fountain Avenue Kitchen discount” of an additional $20 off. I wanted to further mention that I in no way benefit from this post. I simply think Jaclyn is an excellent resource for those wanting to learn more about juicing and hope you find this information helpful. Wow, thanks Ann for your interview with Jaclyn! I’m a beginner to juicing and recently have bought Omega VRT350 juicer after doing some research on this. This is masticating type of juicer and I’m very happy with it. I like the Jaclyn tips and like that these come from professional in juicing. I have a question, how can I store my juice properly and don’t lose any vitamins in it? The point is to make enough juice for a few days. Thanks. Great question, Dave. One point that Jaclyn did make is that the juice is best consumed–in terms of maximum nutrients–immediately. That said, the best way to store for later consumption is in a glass jar with as little air space as possible. I hope this helps and that you enjoy your new juicer! That’s a great interview with jacklyn! Thanks for sharing such a good conversation about juicing!